A while ago we introduced Nurturing Force on our pages with our review or their Airbrush and Brush Cleaner. Today we'd like to tell you about two more products from this fantastic brand specialized in airbrush makeup friendly, HD compatible products. 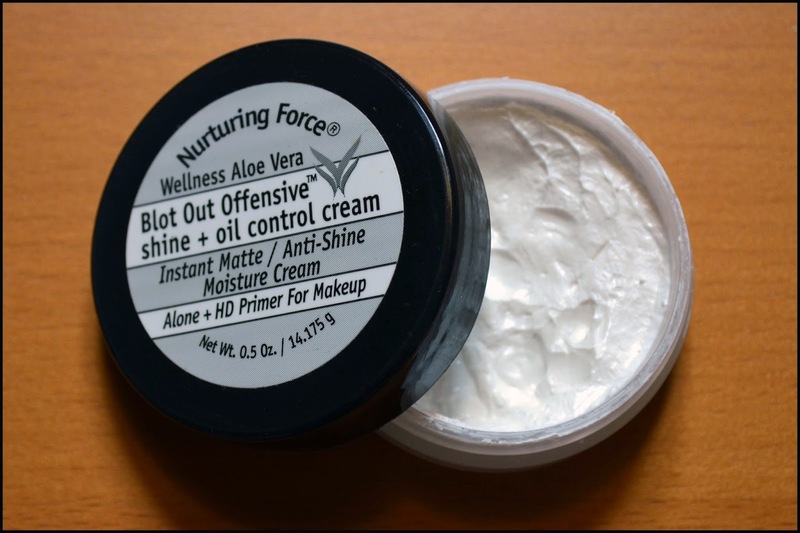 Blot Out Offensive has been Nurturing Force's flagship product for several years now. We found out about it while browsing the Camera Ready Cosmetics website, then read enthusiastic reviews on Kett's website and saw YouTube raves by Koren Zander. All we had to do was try this out for ourselves and see if it would live up to the high expectations the reviews created. The product has a very pleasant frothy consistency that makes it similar to whipped marshmallow filling, with no hint of fragrance, which I personally appreciate. It dries very fast on the skin, so it needs to be applied quickly and in small quantities. As its name suggests, this Aloe Vera, silicone free formula is an instant mattifier whose primary goal is to keep oil production under control, improving the duration of foundation. I have tried it both on myself and on several others, and I am happy to report that the primer does what it promises, significantly reducing oil production in the most oil prone areas like the T zone. I would not venture on specific duration times for its mattifying effect as this is subject to individual pre dispositions, as it would be for any other product. My own T zone tends to be quite oily, especially in the summer, and I found that Blot Out Offensive held up very well throughout the day. Despite the absence of silicone the cream also has a noticeable filling power, smoothing enlarged pores without blocking them. I especially appreciate the absence of silicone as this allows the primer to be used on those who have an intolerance to it and it makes it ideal for water based makeup. Its very matte finish means it may not be the best choice for the under eye area, but this is where Nurturing Force's next brilliant product comes into play. 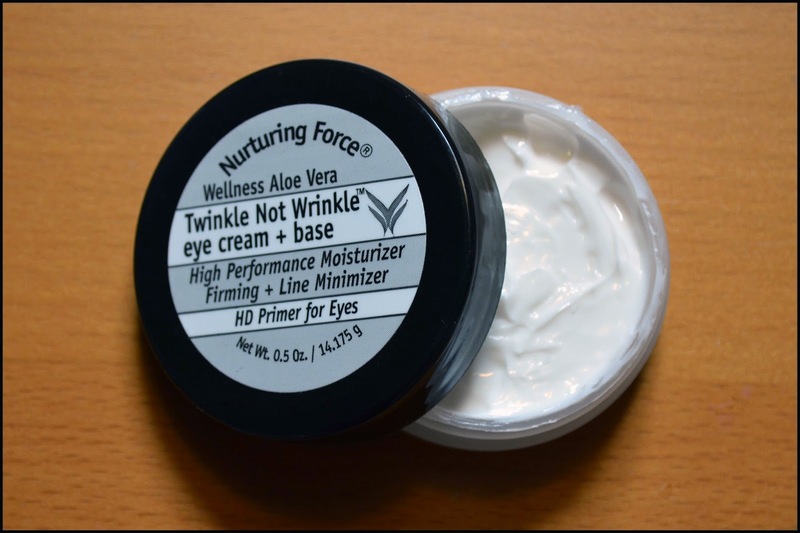 Twinkle Not Wrinkle eye cream and base is an HD primer for eyes, also based on Aloe Vera and enriched with Hyaluronic Acid and Cherry Kernel Oil. This product does contain silicone (Dimethicone), which makes its texture very smooth and more similar to a traditional cream. Unlike Blot Out Offensive you can take your time applying this, but just like the face primer it has no fragrance at all. The feel and final finish is very soft, hydrated and luxurious, but, unlike many other primers, never too slick. It provides an excellent base for eye makeup, improving durability and helping against creasing. When used with traditional powder eye shadow it will also dramatically improve the color payoff. We simply love Nurturing Force. This family run business has a strong commitment to natural ingredients, excellent quality and a special attention to the needs of airbrush makeup. They are a regular presence at most of the major trade shows, where they often offer their products in special money saving kits. The brand includes several other products that we hope to review in the future. We also hope they will heed our suggestion and finally come out with the only thing that seems to be missing from their line: a natural ingredients based airbrush makeup fixing spray! For those of you reading this in Europe, Nurturing Force products can also be ordered from Guru Makeup Emporium in London. Un primer senza siliconi ??? Sono super entusiasta della notizia! purtroppo quelli in commercio ne sono pieni! This primer is really good! This excellent primer to 'aloe vera, no silicones and no fragrance, great for those who like it has a delicate skin, this company works fine, then I love the family farms, working with the heart, but as you say then just missing one spray fixative for makeup and is so full! It's very excellent primer...I'm so surprised!!! Have you checked out tickled pink airbrush makeup yet? It is all natural just lime nuturting force and great for post surgery makeup as well.